Mom FAQ: Why Does My Baby Grunt? Why do little babies grunt? This is actually a pretty common question amongst new parents. Newborn babies are a cacophony of noises: coos, grunts, burps and squeals. However, if your baby is making noises that are making you concerned, it never hurts to make sure that everything is normal. The fact is that there are a few different reasons why your baby might be grunting, which may or may not be serious. It’s perfectly normal for babies to make these noises, but it’s also possible that there is a serious medical reason for them. Normal breathing: Babies have small nasal passages and it doesn’t take much for them to get clogged up. The grunting you hear might just be them trying to breathe. You might want to invest in a nasal aspirator. When To Worry: If your baby seems to be grunting with each breath, they might actually be having trouble breathing. In this case you should seek the advice of a pediatrician as soon as possible. Pleasure & communication: Some babies simply grunt to show their contentment or as a way to communicate. As your baby starts to realize that making noises gets the attention of their parents, they’ll become more likely to make them, too. If your baby seems to be making noise in reaction to external stimulus, this is probably all that it is. Pooping: Sometimes it’s just because of poop. Babies have weak abdominal muscles, and grunting helps them push as it closes the larynx. Breathing: For babies, grunting can sometimes be caused by the same reasons adults yawn. When breathing shallowly, sometimes the alveoli in the longs collapse. In an adult or older child, this results in a yawn, which causes the lungs to re-fill with oxygen. Since babies haven’t developed this reflex yet, they will grunt, which accomplishes the same thing. It’s possible that your baby is grunting because they’re in distress. If your baby seems to be grunting with every breath, is struggling for breath, or seems to be in distress, please seek the aid of a medical professional immediately. 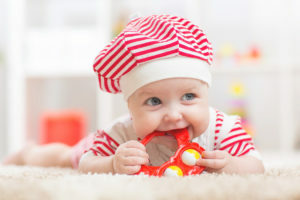 Natural teether choices baby will love. Because the teething process is no fun at all.